Hinduism, the ancient Indian religious system, is arguably one of the most complex of known religions and its complexity has become one of its many characteristics. Unlike most religions that base their faith on one definitive set of guidelines and rules, Hinduism does on confine itself to a single text, or a single interpretation or a single approach—which is also why it is so vibrant and rich. Given this heterogeneous character, rules, regulation, norms and guidelines of the Hindu way of worship, spirituality and all other aspects of the religion, have to be seen, always, in a larger context. Agama Shastra, a collection of ideas that lays down the rules for worship, temple building, spirituality and rituals, has for long been a guideline for many people of the Hindu faith. It is a collection of Sanskrit, Tamil and Grantha scriptures that contains, mainly, methods of temple construction, idol creation, philosophical doctrines and meditative practices. As a compendium of sorts that came into being after years of assimilation and from a variety of sources, the Agama shastra as a whole cannot be dated; some parts of it being pre vedic while the others are post vedic. As the complete guide, Agama Shastra plays a very important role in consecration and construction of holy places; most Hindu places of worship follow the tenets of the Agama Shastra. While the Agama are many in number, each of them consists of four parts: Kriya Pada, Charya Pada, Yoga Pada and Jnana Pada. While Kriya Pada expounds more tangible rules– rules of construction, sculpting, carving consecration of Idols etc. the Jnana Pada deals with something more lofty, the philosophy and spirituality of temple worship. Temples and places of worship cannot be built arbitrarily or on the strength of some local notion, for everything is laid down categorically in the Agama shastra. For example, for a pilgrimage the three essentials are Sthala, Tirtha and Murthy, where the Sthala refers to the place of the temple, the Tirtha signifies the temple tank and Murthy stands for the idol. 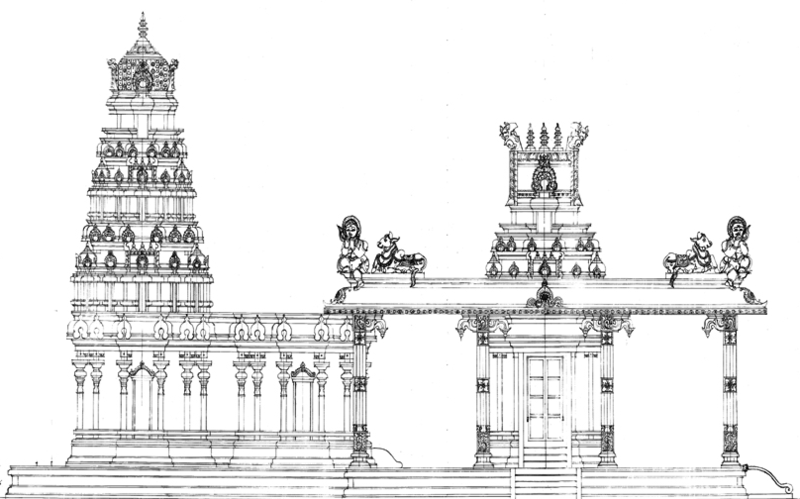 There are rules in the Agama Shastra for just about every aspect, including the smallest detail, from the positioning of the holy figurine to the materials from which the temple is to be constructed. Unlike the Vedic guidelines, that focus more on Havan Building, Agama Shastra dwells at length on idols and figurines of the deities. It dwells in such detail that it is in places almost like a scientific blue print for temple making. Given how temples in India are spread, over a vast territorial space, it is amazing how Agama Shastra is employed and followed throughout the majority of these temples, notwithstanding the cultural and regional differences; perhaps, there is something divine about the Agama Shastra.